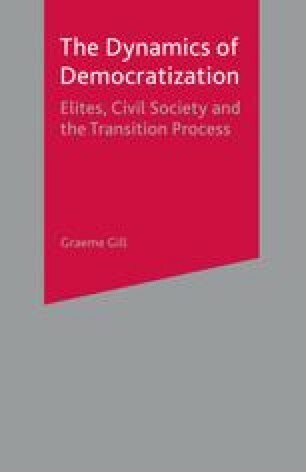 In previous chapters the basic struts of a theory of democratization that brought together the élite focus of the transition school and the civil society emphasis which has been missing from that theory have been put in place. In Chapter 2 a number of considerations relating to regime breakdown were outlined. In Chapter 3 a typology of modes of transition was noted. In Chapter 4 a range of propositions concerning the relationship between state and society and the nature of both of these was suggested. It is time to bring these together into a more integrated treatment of democratic transition, using a number of the cases of such regime change which have been the foci of attention of the transition literature. These will be discussed in terms of the typology of modes of transition, with a view to showing how an understanding of the role of civil society and its relationship with the state is essential to satisfactory comprehension of the process of transition itself.